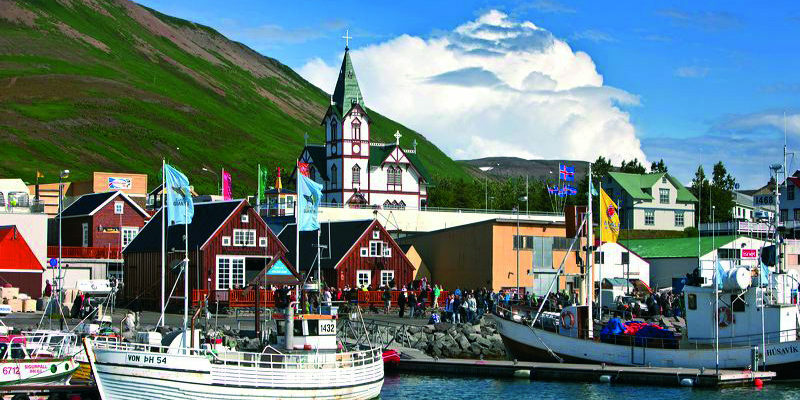 Húsavík, a fishing village and a perfect centre for individual tourists and groups travelling in the Northeast.Húsavík offers an ample selection of easy hikes through varied landscape for example, along the shores of the bay, up the Húsavík mountain or around the lake Botnsvatn where trout fishing is free of charge. The town is now well known as the whale watching capital of Europe. Whale watching trips from Húsavík harbour on traditional fishing boats and passenger boats are getting increasingly popular. The Husavik Whale Centre is the first and only information centre on whales in Iceland. Húsavík being located just south of the Arctic Circle enjoys 24 hours daylight in summer and the romantic midnight sun frequently paints the evening sky with colours beyond imagination. In the winter when the days are short and the nights are long the dark night sky is frequently decorated with millions of stars and flashing Northern Lights (Aurora Borealis).